Here's a fun find from my recent trip to Canada! Turns out my weekend up in Mississauga was the same weekend that various stores were pushing new merchandise onto shelves. At Walmart, one of the blasters of interest was one I hadn't seen any news on before, save for a design patent out of Hong Kong. I present the Gunsmoke Pistol! 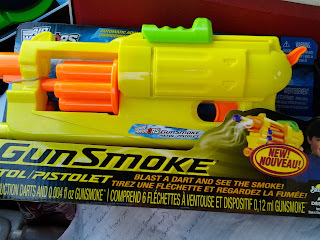 In my review for the first Gunsmoke blaster, I gave it an excellent review, based mainly from the perspective that it was in its own category, and that it should be judged by how well it does its job. Now that we have more than one Gunsmoke product, however, performance will have to be a consideration. Fortunately, the Gunsmoke pistol can stand on its own, although it's still just shy of a Strongarm in performance. 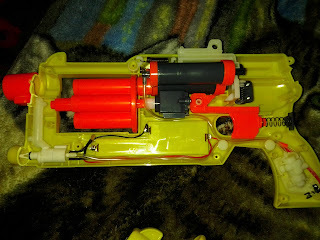 This blaster takes three AA batteries to power the smoke circuit. Let's open this up and see why it's such a wide blaster, eh? Note: you need to slice the barrel cap and "hammer" each in half, otherwise you warp the shell trying to pull things loose. The screws and the internals sit on the same side of the shell. 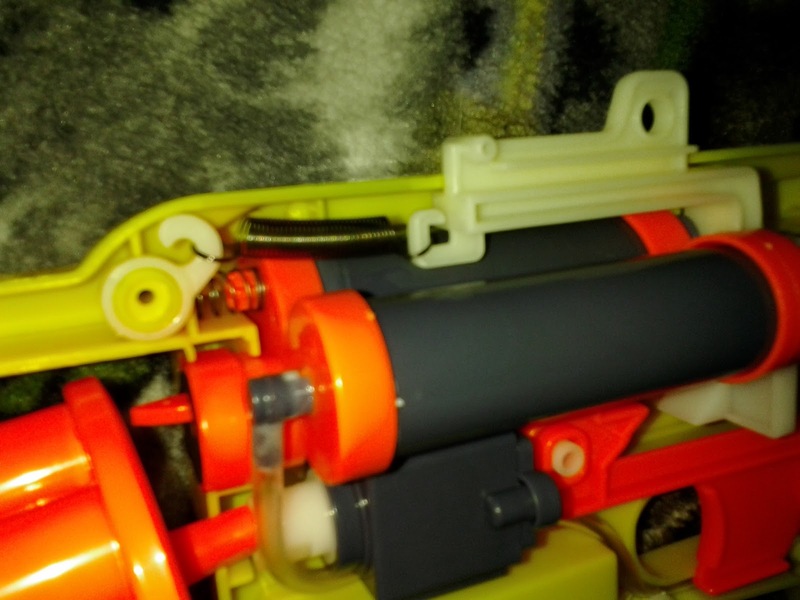 Once you remove the screws, turn the blaster over, lift off the other half of the shell, and WTF IS GOING ON HERE? 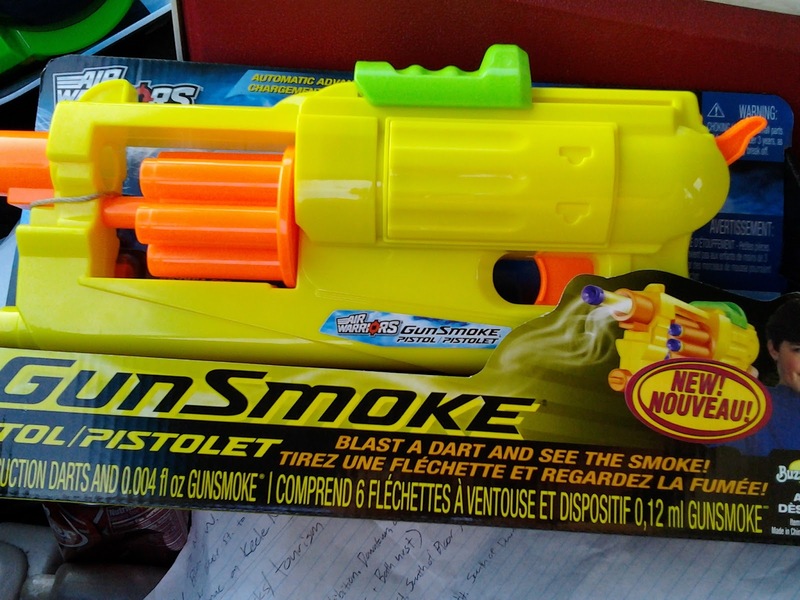 Remember how the first Gunsmoke blaster was essentially a Double Shot, but with one plunger powering the smoke instead of launching a dart? In the pistol, we have two plunger tubes sitting side by side. 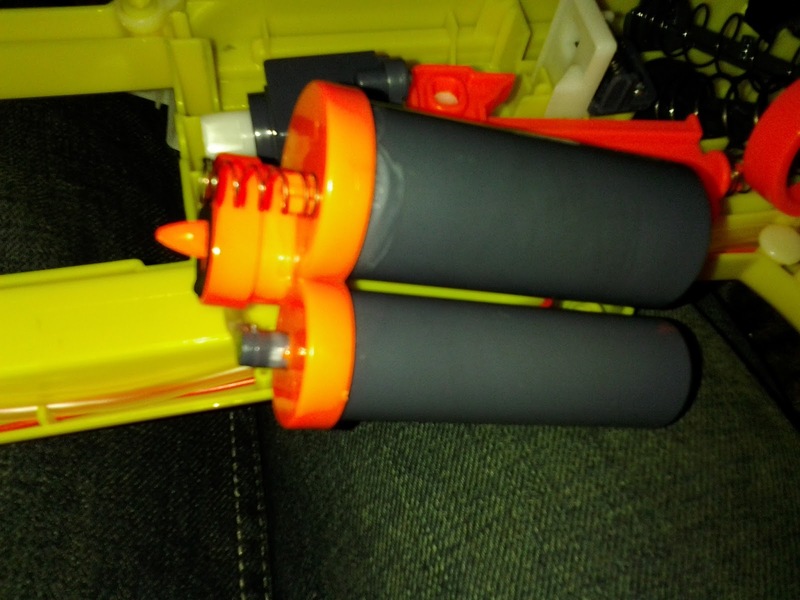 The larger one (larger than your typical Nerf Elite plunger tube, at least) goes to the turret via air restrictor. 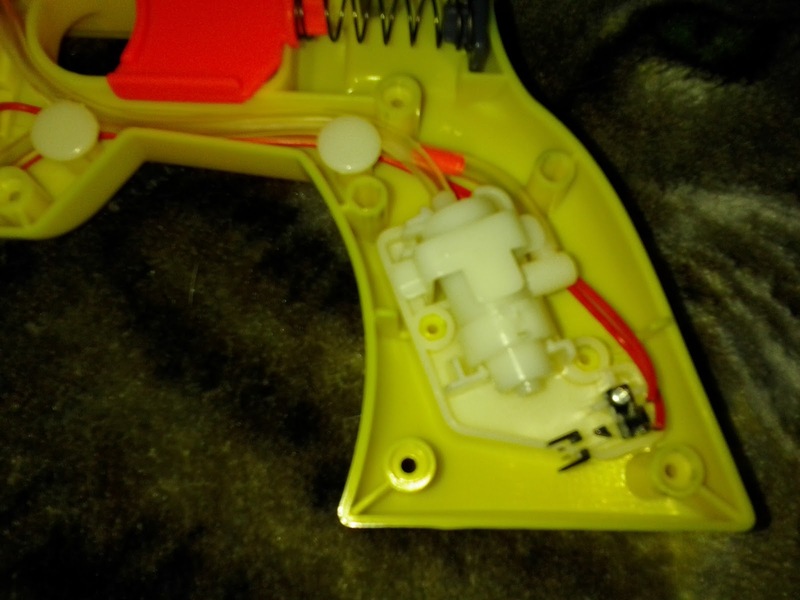 The other connects to the smoke mechanism. A better view of the plunger tubes for comparison. The seals on the plungers are very good. When the blaster fires, the secondary plunger compresses the air and opens this slow-bleeding valve. The tiny plunger makes contact with a switch, which then sends current to the smoke emitter up front. The slow bleeding air follows yet another tube and carries the rather acrid vapor up into the blaster's faux barrel. But how does the blaster perform? 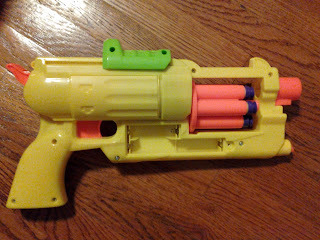 While I don't have chronograph numbers at the moment, average (angled) ranges were poor with the included sucker darts, but 65' with Elite streamlines and Knex darts. Without the air restrictor, the average was 75'. 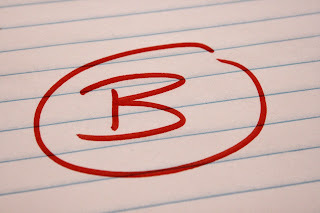 The plunger and spring are more than sufficient for Elite ranges. If the dart barrels were longer, this blaster would have the same ranges as similar blasters.